My interests as a visual artist, educator and curator are strongly influenced by themes relating to transformation, memory and perception, identity, and place. Through the use of mixed media along with experimental and traditional techniques, I incorporate a variety of working methods into my photography, prints and books. In this series of photographic images I am exploring themes of personal and geographical landscape from an alternative point of view. Utilizing my body and photographic chemistry to create direct imprints on film, the resulting negatives are then scanned, cropped and printed as large-scale digital prints. 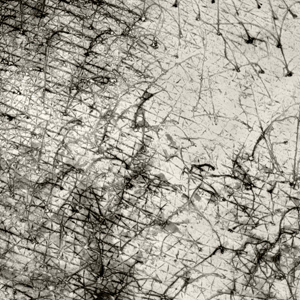 Visually, the "body prints" mimic aerial landscape photographs, where scars, hair, or wrinkles are reduced to black and white lines that emulate land and water formations. Through this comparison, a correlation is drawn between the earth's surface as a record of natural and man made alterations, and the body (specifically the skin) as a record of individual experience. Skin is a reflection of a person in that it denotes age, culture or race, well-being, as well as identity. Fingerprints, which appear on the hands and soles of the feet, do not change over the span of a lifetime offering one method to distinguish one individual from another. Scarring, hair growth, warts, calluses, wrinkles, and other dermatological variations reveal a range of information about who we are. Our skin provides a record of experience and a means to navigate a particular kind of personal history. In a similar vein, the surface, or skin, of various terrains within the landscape offers a comparable history of the earth's lifespan. Natural and human influenced alterations present a way to detect change, both gradual and immediate. Geological and man-made structures, water formations, erosion, and weather patterns alter the natural world, creating a lasting mark imprinted onto the environment.